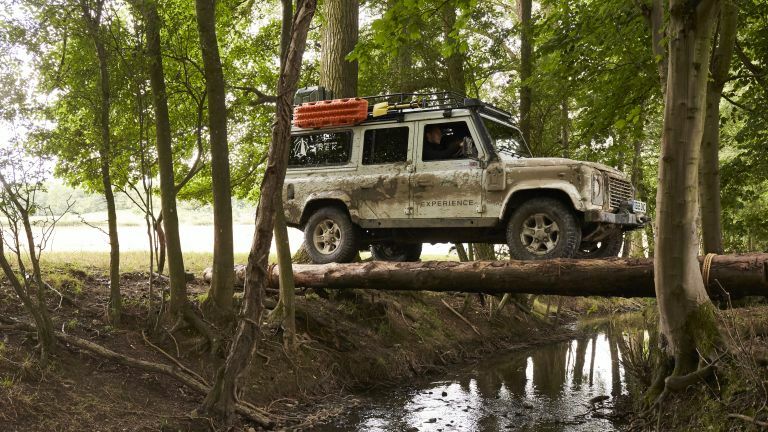 At the end of summer Land Rover launched a new series of experiences called ‘Eastnor Explorer’ expeditions. These give you the opportunity to live out a miniature adventure, and pick up some useful skills along the way. I was lucky enough to be invited along to the launch, and have a mini expedition myself. My adventure started off with long drive through the Cotswolds down to Eastnor, yours will start when you receive your adventure pack in the post. This includes a brass compass, magnesium flint fire lighter, and information about the area. Eastnor Explorer builds on Land Rover's experience and history, drawing inspiration from 1955, when a team of students from Oxford and Cambridge drove Series I Land Rovers from London to Singapore. Many of the skills and activities take part on the courses used for driver selection in the Camel Trophy and G4 Challenge, both of which were held at Eastnor. The succession of three days training will ultimately give you the skills to achieve the overall mission brief of making it to ‘Camel Bridge’ which lays deep in the most inhospitable and seldom used area of the Eastnor. It's not just about conquering the wild in monster machines either, as is the Land Rover way, you will also be taught to tread lightly, causing the least disruption to to the natural habitat as possible. Once I'd arrived at the Land Rover Experience Centre at Eastnor it was time for the driver briefing, where you learn a little about the route, the car, and what you'll be doing that day. It's also a chance to introduce yourself to your team members, because, as we'd find out later in the day, team work will be very important. The course takes place over a maximum of three days, which can be booked separately or together, giving you the flexibility to fit learning in around your busy schedules. I took part in a special one day condensed course, with a goal to reach Camel Bridge, learn how to build a bridge from logs, and drive over it. No mean feat in 8 hours. After the driver briefing we went out to prepare the vehicles. We'd be driving expedition prepped Land Rover Defenders, complete with winches, roof racks, and snorkels. Preparing them involved loading up ropes and refreshments into the back, as well as attaching traction mats and shovels to the roof rack. It turns out, we did need everything we packed (especially the refreshments). With that complete we set off for the wilderness. After getting used to the vehicle with some not-so-challenging terrain we reached a point where a tree branch blocked or path. We got out and accessed the situation, do we hack the branch away with a machete (the Bear Grylls approach) or simply move it out the way to let the Defenders past (the Ray Mears approach). Naturally, we chose the latter. Minor obstacle past and we're back on the move, navaging Eastnor using a map and talking to the rest of the convoy using walkie talkies. The Land Rover Guide said we didn't need to end every transmission with 'over', but we did anyway. We arrived at our first stop, a purpose built training ground where we could learn some basic skills in a controlled environment. Here we learnt two key lessons, how to tie knots and how to drive over a log bridge. The two knots we'd need when constructing the bridge were a timber hitch and clove hitch. These would keep the two logs together when driving over the bridge, so it's pretty important we paid attention. We also practised driving over a bridge, although this one was three inches above ground rather than 7-feet, allowing us to see who's best at specific jobs. This would come in useful for the final test. We decided a team mate had better clutch control, therefore would make the better driver, while I was best at guiding (telling the driver where to point the wheels). Basic skills learnt and we're back on the road towards the Camel Bridge. This time the terrain was a bit more difficult. I managed to get stuck while driving, which resulted in the everyone needing to climb out, and dig the mud away from underneath the vehicle. The Defender behind us had to tow us out. It must have taken twenty minutes to break free, but the atmosphere was euphoric once we finally did. We had a similar feeling when we tried to cross a stretch of deep water. It took several attempts, but we eventually made it. During these tricky moments we learnt lots of new techniques, including how to steer for traction and the need to do windows up when ploughing through deep, smelly water. We made it to the lunch spot, and built a tarpaulin cover (even though it wasn't technically necessary). Time to whip out the magnesium flint lighter. Now two options, either find some moss to use as a fire starter, or petroleum jelly wrapped in a cotton wool pad. I chose the slighter faster, easier, man made option. After several strikes of the flint we had a roaring fire in no time, boiling water inside a kelly kettle. As well as hot drinks (inside Cambridge and Oxford themed tin mugs), Land Rover put on a delicious spread of sandwiches, crisps, and cakes. Lunch was finished off with amazing toasted marshmallows. Once full we safely disposed of the fire and got back on the road (well, not exactly the road, but you know what I mean), heading towards our final challenge. After some more offroading we reached a ravine about 7-foot deep, straddled by a partially built log bridge. Our final task was to finish off the bridge with the knots we'd learnt earlier in the day, then drive over it. With minimal help our team managed a really neat timber and clove hitch (not bragging, but the other team needed a little more help). Once the guides had inspected the knots and determined they were ready to be driven on, we lined up the Defenders. I crossed the river and began to direct the driver using a series of hand signals. He creeped onto the logs. We slowly advanced over the bridge, making micro adjustments to the steering. I wasn't that worried as I could see what was going on (I only had the life of two men in my hands), but I'm told by the driver that it was genuinely terrifying, relying solely on my directions unable to see the logs below him. Just like when we freed ourselves from the mud, it was euphoric as we made it across the river in one piece. It's great to see Land Rover sharing its knowhow with wannabe adventurers (like us). While many of the brand's cars will never get this muddy, it's a great link between Land Rover's heritage and its customers who aspire to be Ranulph Fiennes. Scott Dicken, Jaguar Land Rover UK Marketing Director, said, “At Land Rover we produce some of the most capable vehicles in the world, and our history in exploration is unrivalled. What we really wanted to do with ‘Eastnor Explorer’ is teach people how to make the most of their Land Rovers, while also introducing them to the wonders of the fantastic Eastnor Estate. It’s a haven for off-roading, and provides a stern test for our vehicles and their drivers. The Eastnor Explorer expeditions costs £325 per driver for each day, and £95 for passengers/ navigators. A minimum of two guests are required for the course, which includes seven hours of tuition, lunch and refreshments. You can book the course on Land Rover's website.